The study population was categorized based on the academic year. 19.4% of the participants were in 1 st year, 30.6% were in 2 nd year, and 50% were in 3 rd year of PG [Table 1]. When comparison was made for gender, males were significantly competent to comply infection control policies and procedures (P < 0.040). When comparison was made for the academic year, 3 rd year PG students were significantly competent to comply infection control policies and procedures (P < 0.017) and to adapt the dental practice to the existing laws and regulations (P < 0.45) [Table 2] and [Table 3]. The top five areas in which participants thought they considered themselves more competent were their competency to design, implement, and evaluate community preventive interventions 105 (84.7%), competency to elaborate the socio-economic-cultural diagnosis of the community 101 (81.5%), competency to design, implement, and evaluate community restorative interventions 96 (77.4%), competency to promote health and oral health through creation of healthy settings 95 (76.6%), Competency to elaborate the oral health diagnosis of the community 94 (75.8%) [Table 4]. The top five areas in which participants thought they considered themselves less competent were their competency in carrying out biostatistical tests 57 (46%), competency to develop ways of helping the community toward easy payment plan 65 (52.4%), competency to promote health and oral health through health education 70 (56.5%), competency to take up initiatives in formulating policy and maintaining lobbying 70 (56.5%), Competency to apply ethical and moral standards while carrying out epidemiological researches 73 (58.9%) [Table 5]. Although the use of self-administered questionnaires is the most widely reported method for collecting data about self-perceived dental competencies, the possibility of bias (e.g. respondents' overestimation of competencies) in the responses should be considered [Table 7]. 1. 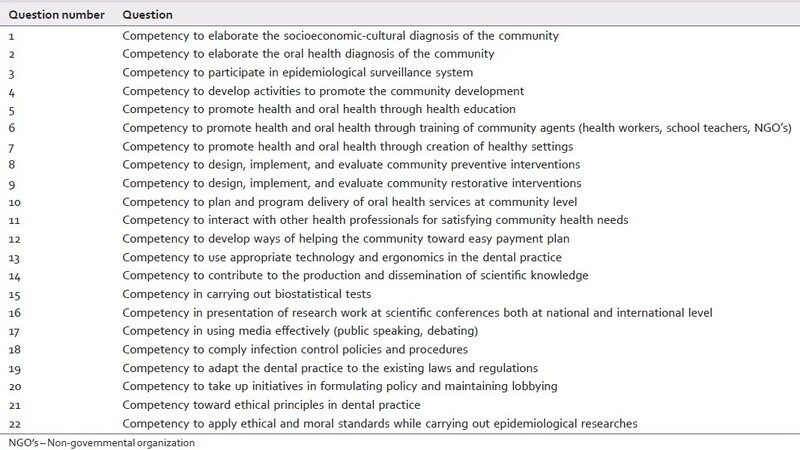 Preamble to the competency statements for dental public health. J Public Health Dent 1998;58 Suppl 1:119-20. 2. Burt BA, Eklund SA. Dentistry, Dental Practice, and the Community. St. Louis, United States: Elsevier Saunders; 2005. 3. 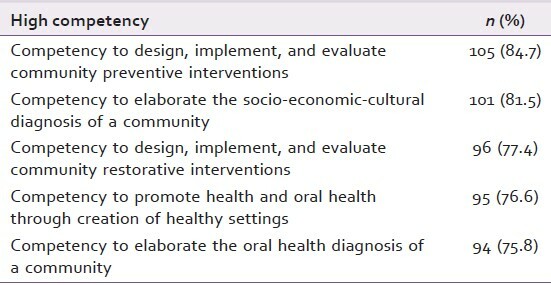 Dental public health competencies. J Public Health Dent 1998;58 Suppl 1:121-2. 4. Greenwood LF, Lewis DW, Burgess RC. How competent do our graduates feel? J Dent Educ 1998;62:307-13. 5. Rafeek RN, Marchan SM, Naidu RS, Carrotte PV. Perceived competency at graduation among dental alumni of the University of the West Indies. J Dent Educ 2004;68:81-8. 6. Gerbert B, Badner V, Maguire B, Martinoff J, Wycoff S, Crawford W. Recent graduates' evaluation of their dental school education. J Dent Educ 1987;51:697-700. 7. Schmidt HG, van der Molen HT. Self-reported competency ratings of graduates of a problem-based medical curriculum. Acad Med 2001;76:466-8. 8. Revised Ordinance governing MDS course from the academic year 2009-10 onwards. Available from: http://www.rguhs.com. [Last accessed on 2011 Oct 08]. 9. Bernabé E, Ludeña MA, Beltrán-Neira RJ. Self-perceived public health competency among recent dental graduates. J Dent Educ 2006;70:571-9. 10. Aiken L. Content validity and reliability of single items or questionnaires. Educ Psychol Meas 1980;40:955-9. 11. Muñiz J. Classical Theory of Tests (Tests Classic Theory). 2 nd ed. Madrid: Ediciones Pyramid; 2000. 12. Hernandez R, Fernandez C, Baptista L. Methodology the Research (Research Methodology). 2 nd ed. Mexico D.F: McGraw Hill; 1999. 13. Strauss R, Mofidi M, Sandler ES, Williamson R 3 rd , McMurtry BA, Carl LS, et al. Reflective learning in community-based dental education. J Dent Educ 2003;67:1234-42. 14. Skelton J, Mullins MR, Kaplan AL, West KP, Smith TA. University of Kentucky community-based field experience: Program description. J Dent Educ 2001;65:1238-42. 15. Zarate G, Bernal J, Balarezo N, Izquierdo J. The experience in dental education of Cayetano Heredia University of Peru. Educ Med Salud 1978;12:436-56. 16. Mondoñedo J. Community teaching-service experiences in dental education of the Social Dentistry Department. Rev Estomatol Hered 1991;1:27-30. 17. Anastasi A, Urbina S. Psychological Tests. 7 th ed. México City: Prentice Hall; 1998.